NUEVA ENTREGA DE LA COLECCIÓN “APRENDE A DIBUJAR” QUE LLEVARÁ EN ESTA OCASIÓN EL NÚMERO #0 DE PORTADA YA QUE, AUNQUE SIGUE LOS PARÁMETROS GENERALES DE LA COLECCIÓN, EN ESTA OCASIÓN ESTÁ REALIZADO POR SÓLO UNA PERSONA. Y ES QUE MUCHOS HABÍAN SIDO LOS QUE NOS HABÍAN SOLICITADO UN MANUAL CON DISTINTOS TEMAS QUE FUERAN UN COMPENDIO BÁSICO SOBRE ALGUNOS TEMAS COMO LA NARRATIVA, LA COMPOSICIÓN DE PÁGINA Y DEMÁS POR ELLO, PARA ESTA INSIGNE OCASIÓN SE ENCARGÓ HACE ALGUNOS AÑOS LA ELABORACIÓN DE ESTE MANUAL A ÁLVARO MUÑOS, DIBUJANTE DE LA REVISTA “KISS” Y PROFESOR DE LA ESCUELA DE ARTE C-10 DE CARLOS DIEZ. 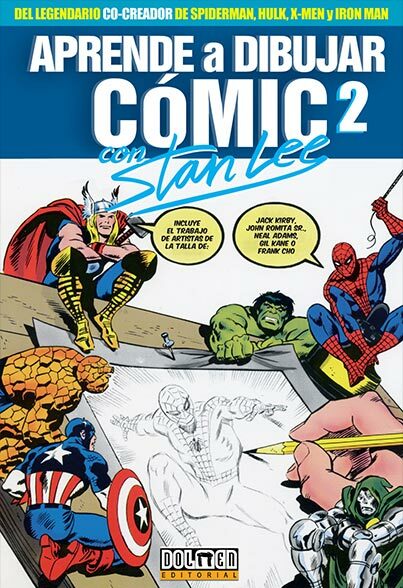 “APRENDE A DIBUJAR CÓMICS” #0 ES EL PERFECTO MANUAL QUE DA FORMA A TODA LA COLECCIÓN YA QUE TE ENSEÑA CÓMO FUNCIONAN LOS CÓMIC Y CÓMO HACERLOS, DE LA MANO DE ÁLVARO MUÑOZ, DIBUJANTE DURANTE AÑOS DE LA REVISTA “KISS COMIX” Y VETERANO PROFESOR DE DIBUJO EN LA ESCUELA C-10 DE CARLOS DIEZ. UN COMPLETO LIBRO FRUTO DE CUATRO AÑOS DE TRABAJO DONDE EL LECTOR ENCONTRARÁ TODO SOBRE PLANOS, COMPOSICIÓN Y CONSTRUCCIÓN DE VIÑETAS, USO DE LOS ESPACIOS, USO DE LÍNEAS CINÉTICAS, PERSPECTIVA, PROGRESIÓN DE PLANOS, LOS PUNTOS DE VISTA, TIPOS DE TRANSICIÓN, NARRATIVA, ELABORACIÓN DE UNA PÁGINA, USO DEL TIEMPO… Y ESTO ES SIMPLEMENTE UNA PEQUEÑA PINCELADA DE LO QUE HAY EN SU INTERIOR. TODO LO QUE SE NECESITA SABER PARA COMENZAR A TRABAJAR COMO PROFESIONAL, CON CONSEJOS, MULTITUD DE LECCIONES Y TODO TIPO DE TEMAS, EN UN LIBRO EN EL QUE EL AUTOR HA EMPLEADO CUATRO AÑOS DE SU VIDA. UN COMPLETO MANUAL QUE REPASA TODOS LOS PUNTOS NECESARIOS PARA LA ELABORACIÓN DE UN COMIC DESDE EL PRINCIPIO HASTA EL FINAL.